A steel numbering system is used to identify the many types of steel. A steel’s numerical name usually consists of four numbers or digits. The first two digits refer to the alloy content. 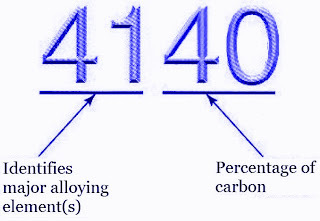 The last two digits (or three digits, in the case of a five- digits number) refer to the percentage of carbon in the steel. See Figure 1 below. The steel numbering system is shown in Table 1 below . In 5147 steel, for example, the “51” identifies chromium as a key alloying element. In 2517 steel, the “25” indicates that there is an unusual amount of nickel in this steel. In 4718 steel, the “47” indicates that the amount of chromium, nickel and molybdenum in the steel is higher than average. In 1040 steel, the “10” means that the steel has very little alloy content except carbon. As shown by these examples, the first two numbers always give an indication of the alloy content in the steel. The last two digits (or three digits) of a numerical name for steel indicate the percentage of carbon in the steel. A two digit number represents hundredths of a percent. 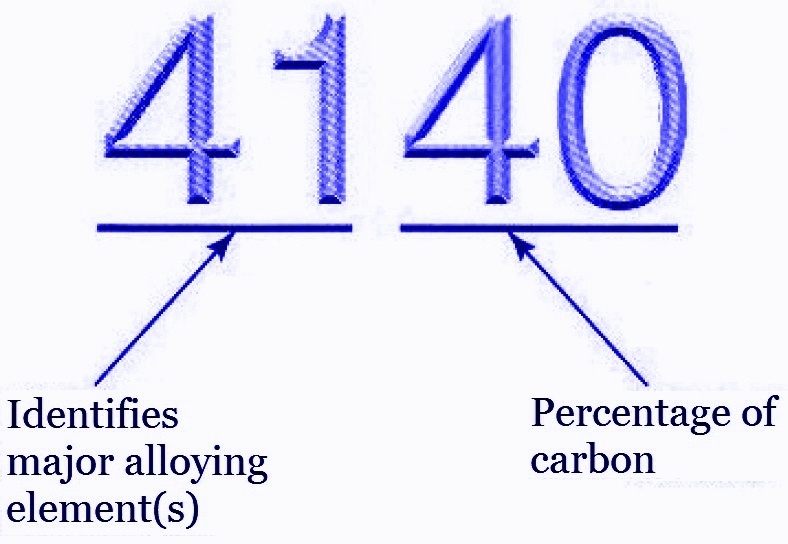 In 1040 steel, for example the “40” means there is 0.40% carbon in the steel. In the 1018 steel, the “18” indicates the the steel has only 0.18% carbon, thus it is a low steel. There is approximately 0.60% carbon in 8660 steel 0.60% carbon in 8660 steel which would make it medium-carbon steel. When the carbon content of the steel is 1% or more, three digits are needed to describe the carbon content. For example 50100 steel contains 1.00%. See Table 2. A steel numerical name provides much information about the alloy content of the steel. Indirectly, the number tells you about the quality, strength and corrosion resistance of the steel. For example 8622 steel has 0.22% carbon, 0.20% molybdenum, 0.50% chromium and 0.55% nickel. Molybdenum makes this steel strong at high temperatures. Chromium improves its corrosion resistance, while nickel improves the steel’s toughness.